If it is possible to separate the artist from the painter, then as an artist, Tony Conner is methodical, reflective and circumspect, while as a painter he can best be described as intense and energetic. His paintings are uniquely expressive in use of contrasts of value and color, and built on powerful and dynamic compositions. 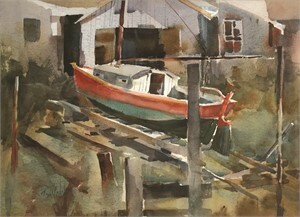 Tony's path as a self-taught artist has followed a serious and active course that has been dedicated to a single medium – watercolor – and an apprenticeship to its unique disciplines. While primarily expressing and interpreting the landscape and seascape, his paintings reflect an interest in a variety of subjects, and exhibit a wide range of representational expression. Most of his work is completely focused on the quality of light itself. Tony's paintings are widely exhibited in juried, group and solo exhibits. His work has been included in a number of national juried exhibits including the New England Watercolor Society National Biennial, Adirondacks National Exhibition of American Watercolors, and the Hudson Valley Art Association Annual National Exhibition, among others. Tony is a Signature Member of both the New England and Vermont Watercolor Societies and an active member of several other watercolor and art societies and an Artist Member of the Salmagundi Club. He is profiled in “100 Artists of New England,” Schiffer Publishing, 2011, “Best of Artists' – American Landscape,” Kennedy Publishing, 2012, and in “Three Who Nurture The Arts,” Southern Vermont Arts & Living Magazine, Summer 2013 and “Learn From What Isnt′ Working,” Plein Air Magazine Aug/Sep 2015. A native of Winchester, Virginia, Tony currently works from his studio in Bennington, Vermont. View Tony Conner's Paintings on our marketplace. Tony Conner If it is possible to separate the artist from the painter, then as an artist, Tony Conner is methodical, reflective and circumspect, while as a painter he can best be described as intense and energetic. His paintings are uniquely expressive in use of contrasts of value and color, and built on powerful and dynamic compositions. 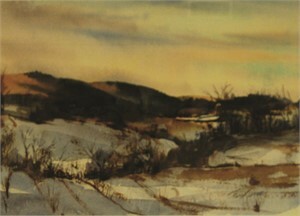 Tony's path as a self-taught artist has followed a serious and active course that has been dedicated to a single medium – watercolor – and an apprenticeship to its unique disciplines. While primarily expressing and interpreting the landscape and seascape, his paintings reflect an interest in a variety of subjects, and exhibit a wide range of representational expression. Most of his work is completely focused on the quality of light itself. Tony's paintings are widely exhibited in juried, group and solo exhibits. His work has been included in a number of national juried exhibits including the New England Watercolor Society National Biennial, Adirondacks National Exhibition of American Watercolors, and the Hudson Valley Art Association Annual National Exhibition, among others. 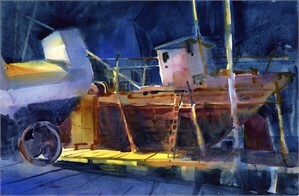 Tony is a Signature Member of both the New England and Vermont Watercolor Societies and an active member of several other watercolor and art societies and an Artist Member of the Salmagundi Club. He is profiled in “100 Artists of New England,” Schiffer Publishing, 2011, “Best of Artists' – American Landscape,” Kennedy Publishing, 2012, and in “Three Who Nurture The Arts,” Southern Vermont Arts & Living Magazine, Summer 2013 and “Learn From What Isnt′ Working,” Plein Air Magazine Aug/Sep 2015. A native of Winchester, Virginia, Tony currently works from his studio in Bennington, Vermont. View Tony Conner's Paintings on our marketplace.